Nope! You’re wrong if it was Imelda Marcos that you had in mind! This Imelda has more sense when she speaks about a particular subject! And she doesn’t represent the mayuming Pinay in a Filipiniana costume but she can be a perfect beacon for all individuals who are still reluctant to climb a mountain because of some some loserly reason as money, gender and time. I have always maintained that there is no mountain in the Philippines that tough that you can’t climb it. And a friend believes in the same thing too saying it is neither a matter of strength nor masculinity; it is a matter of how you make the climb easy and manageable and how willing and able you are to subject your own self to the challenges that you may encounter in your journey. Imelda Lim here doesn’t boast amasona strength and endurance. She will tell you ‘I struggled to make it to the top. But I CLIMBED THE MOUNTAIN!’ After all that’s what mountaineering is basically all about—climbing the mountain! 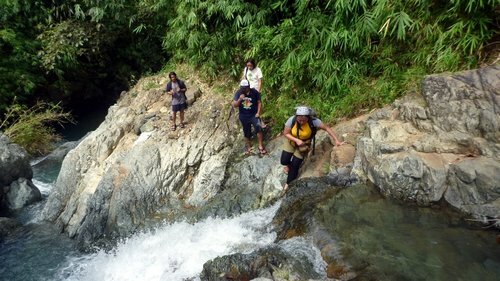 Imelda, a close online buddy of mine back in the multiply.com days of mountaineering, has climbed mountains across the country: from Mt Iraya in Batanes, Tabayoc, Timbak, Bakun Trio and Ugo in Luzon, Kanlaon, Manunggal and Napulak in the Visayas, to Kalatungan, Apo, Talomo, Dulang-dulang and Kitanglad in Mindanao. At least those are the mountains that are familiar to most of us. She has climbed other mountains in the country that you probably have never heard of. And most of them are either solo, or duo or unguided climbs. But it has never been the number of mountains she climbed. It has always been her genuine passion and uncompromising love for mountaineering. In fact, she has traded one of her jobs for a chance to keep climbing. In this article and the next she will relate her story and her insights regarding women in the sport of mountaineering. When was your first climb and where? A co-worker invited me to join her in pursuing her mountaineering dream. 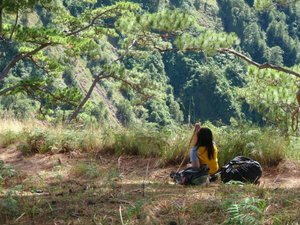 I gladly obliged, and we did a research on her target mountain—Mt Maculot. With my naivete, I proposed that we climb Mt. Manabu for the sunrise, pass the idle afternoon trekking Gulugod Baboy (with visits to Lipa tourist spots), and finally spend the sunset hours in Mt. Maculot. I thought it was that easy even for a sedentary person like me. As expected and out of excitement, I didn’t sleep early and woke up late. We ended up climbing only Mt. Maculot! Start trek was at 1500H, with little water (I’ve got less than 250ml), little food (3 garlic bread sticks, I was on a diet that time), no headlamps (my friend has a lipstick-size flashlight), no proper information, and we were two female trekkers with no mountain guide. Up there, I witnessed the sunset for the first time, the tangerine-turning-crimson sun setting across the side of Taal Lake. At 1800H, we were set to making the descent when other campers discouraged us. They were so persistent in providing us with food and shelter that we decided to stay. Truth was we wanted to spend a little more time with the mountain. It was May 2007 and we were young and naive. Who and what inspired you to climb? That co-worker became my climb buddy. She became a mentor during my early days in climbing. She’s the one who’s always prepared, the one who researched more, the one who trains for every climb….the one who took climbing to heart. We did duo climbs back then including the Bakun Trio, Pico de Loro traverse, Mt. Tabayoc and Mt. Iraya. She is now semi-retired from climbing, and is pursuing other outdoor activities like SCUBA diving, surfing, photography and solo backpacking among others. Also, “trying to prove something” is a powerful fuel in pushing someone to try to accomplish a feat. I am no exception to this one, as I started a climbing career in August 2008… trying to prove that even as a female, no one can dictate nor restrict the mountains I can and cannot climb. Why do you climb? For as long as I can remember, I am smitten by gargantuan structures such as mountains. I marvel at the angles at which they appear the highest and proudest. I can recall a childhood scene where I stood staring at the grandness of Mt. Arayat…How huge, tall and near it stands that I could almost touch it! I was 4 or 5 then. Over the years, the non-climbing me was forever mesmerized whenever I pass by a distinct mountain…until someone suggested that I do something about it and make things happen (ergo Mt. Maculot). We all have different reasons for climbing. And that reason may change through the years. As said before, I started to climb reluctantly, then tried to prove people wrong. It became a calling a year after (I was literally dreaming of mountain hikes whenever I haven’t climbed for more than 3 weekends), until it transformed into a life journey. Before 2007, I never knew the difference between Ilocos and Iloilo, nor that of Cagayan Valley with Cagayan de Oro. That although Pampanga and Pangasinan are both in Luzon, they are two different places. I never knew that Siargao is part of Surigao and that it is not just a typo error. And that Batanes is very far up north while Batangas is just down south of NCR. 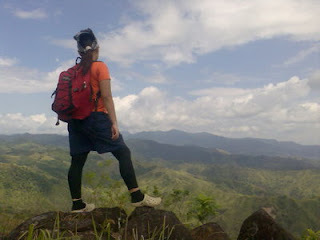 Mountain climbing taught me to go to places and learn geography by heart. Mountaineering will also teach you values you don’t even know existed. It will fortify such values and give you something to stand for. It will make you stand for something. things I have done is to place trust on a fellow climber who clearly doesn’t understand the meaning of compassion, sympathy and camaraderie. closed spaces, lightning, darkness, monsters, bovines, the unknown… practically everything, I can say that it is in itself a big achievement on my part to get outside and smell fresh air and do what I do. More so when I do it solo. Indeed I am conquering myself, one mountain/trip at a time. What is your ultimate mountaineering dream? I dream of absohute rcognition of female prowess in the mountaineering scene. Also, at a more personal level I can only wish for good health that I would still be strong enough to climb even after five years or so. Who do you look up to or respect in the local mountaineering scene?I am not impressed with achievement alone. I regard higher those people with character and values. I basically look up to anyone who exudes respectable attitude towards the mountain, fellow mountaineers, mountaineering creed, outdoor ethics and practices what he preaches. It is hard to pinpoint a specific person because nobody’s perfect, and once you attach that admiration to a specific individual who in turn violates your personal idea of what a true mountaineer is, it can be very, very disappointing. Sha’s Young, Kikay and Climbing! Kat Ocol on "Is Mountaineering Sexist?" Cheryl Bihag on 'Is Mountaineering Sexist?"